Michelle Nebel: Words to Spare • Page 3 of 59 • Out of the overflow of the heart, the mouth speaks. In the fall of 1998, I went off to college and found my tribe. The hills of Shorter College and the sisters of Epsilon Sigma sorority gave me an amazing three-and-a-half years of growth and love and challenge and grace and support and meaning. Ep Sig was a huge part of my identity during college, and when I got a few years out of school and didn’t feel like I could keep wearing all my old college T-shirts, I also couldn’t bear to throw them away. Me in Sept. 1998 wearing a borrowed EpSig jersey on Pledge Night. 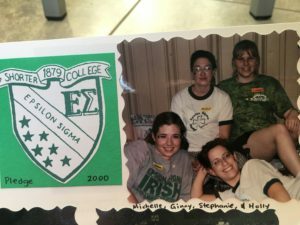 Since it wasn’t a national sorority, there was no Bid Day stuff to deal with back then. 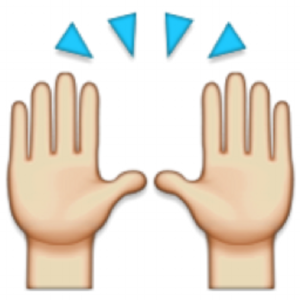 Any unpledged woman could choose to join one of my school’s three sororities. On Pledge Night, she declared her choice in a ceremony that involved, among other things, racing through a series of dormitory hallways and hollering out of a 2nd story window. 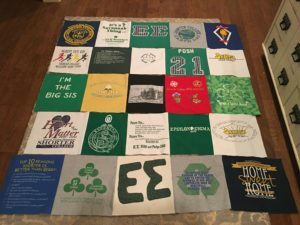 She received a jersey or shirt in her org’s colors and waited on all the other new pledges to declare, and then the real fun began. Two years later on Pledge Night. 2000 was my FAVORITE year. 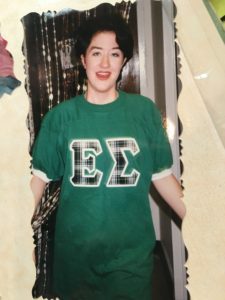 In 1998, as a pledge, that night was busy and crazy and fun and stressful – we learned what felt like a million ceremonies, rules, songs, and cheers. In 1999, as a Prospective Big Sis, it was busy and crazy and fun and stressful – we were observing all the Pledges and figuring out who we were going to adopt as Littles (we had so many pledges in ’99 that I actually ended up with twins!). But in 2000, I was a seasoned pro and as a Grand-Big Sis, I got to calmly support my Littles while they were busily and crazily choosing their own Littles (one single and one set of twins). I’ll update when I finish it. It will be neat to see & use (albeit in a new way) these shirts all the time again, twenty(ish) years later.